The Benefit of Retreat | Create. Communicate. Connect. It’s not like I don’t get any writing done at home. After all, I’m sitting here at home as I write this right now! But when I’m home, I’m surrounded by things that all have the potential to pull my focus away. It might be the pets, it might be a dirty kitchen, it might be channel or radio surfing, making a snack, and it’s probably all of the above and more. At the end of these “writing-focused” days, I inevitably feel a little disappointed that I didn’t write as much as I’d hoped. Walking through the wetlands, I found the perfect first location to set up shop. The last time that happened, I had a good sit down with my calendar and picked the first day I had open to declare an official writer’s retreat. Yesterday was the day, and I spent it at the Morris Arboretum. 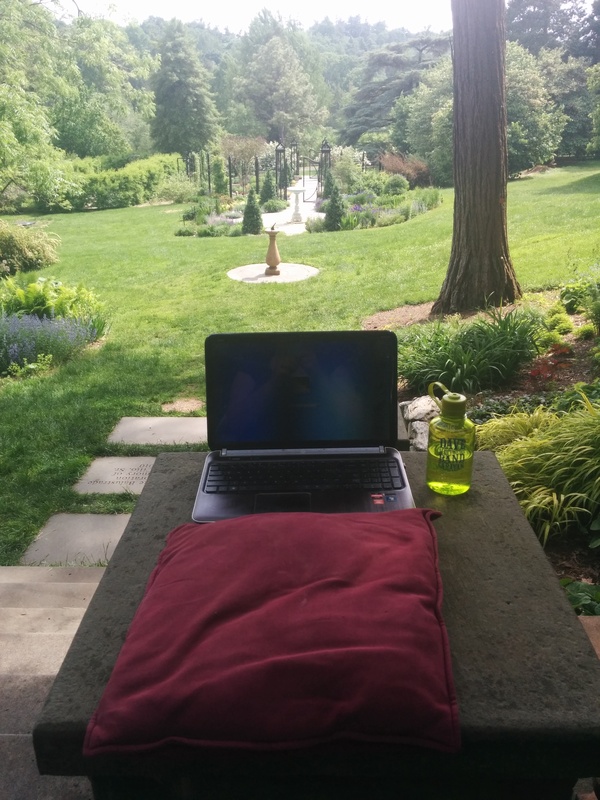 It was amazing, and in the afterglow of its great success I have some tips to share about making the best out of a writer’s retreat. One of the best things about my retreat was that I was just so jazzed to be at the Arboretum on a beautiful spring day. I love the outdoors, I love gardens and woodsy areas, I love a place with a lot of different nooks and crannies, and I love feeling of the air and sun on my skin. So being at a place like the Arboretum made me buzz with joy, and that buzz was just the fuel I needed to work on my novel. When I decided to do this retreat, I posted an invite on Facebook for any interested artist friends to use one of my guest passes and join me. I had a gut feeling that starting the day off with another artist, parting ways to explore our art forms, and then coming back together for lunch and discussion would be a soul-feeding way to structure the day. I was right. There was something to being there with another artist – even when we weren’t directly in each other’s company – that added a layer of meaning and craft to the day. 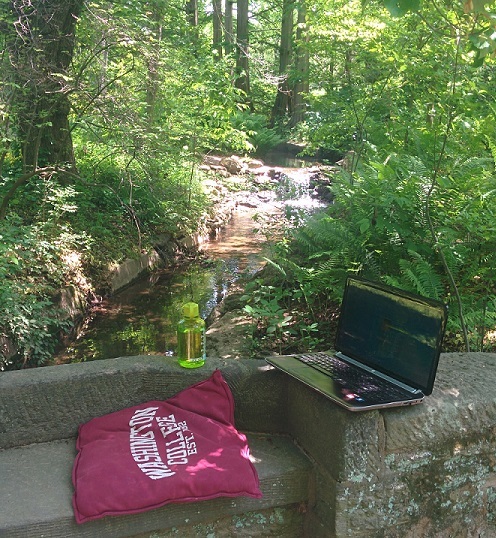 A nice cushion, the running stream, the perfect place to set my laptop, this was a great second spot. 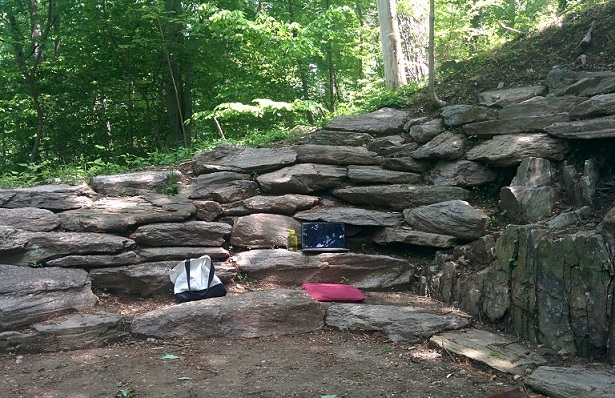 I chose a stunning perspective for my final writing spot of the day. Speaking of flow…let it. Whatever it is, whatever order it comes in, however it wants to come out, just let it. While my main focus was reconstructing Chapter 3, I added notes and some short passages to Chapters 4 and 5, too. Within Chapter 3, I jumped ahead at least twice to scribble down parts of what was to come. When I was done, I scrolled back and picked right back up where I left off. I know some writers find it daunting to write out of order, but I encourage you to let that fear fly away in the spirit of the retreat. The reason these ideas are coming to you out of order is because you’re inspired by what’s going on around you, and that’s the whole point of the day! In fact, it’s so much the point of the day that it’s important to spend time drawing ideas from your setting. While you might be in a location that’s very different than the settings in your story, you never know what might trigger an idea. As I walked around the grounds, I was thinking about my character moving through space just like I was moving through the Arboretum, and imagining what that space might look like. It’s always great to think of our stories in three dimensions from time to time. All I could think about at the end of the day – besides my bursting pride at how well the retreat went – was how I couldn’t wait to do another. As I keep on trucking through my revisions, these retreats are going to become a staple of my summer. I hope you’re able to try one, too.